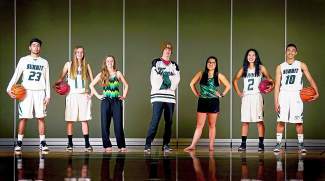 Summit High School winter athletes (left to right): Sophomore Dimitri Preciado, senior Megan McDonnell, Emily Pappas, senior Wyatt Dickerson, senior Maddy O'Malley, senior Jess Horii, junior Jesus Moya. 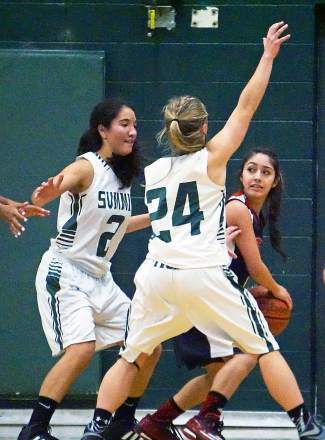 Summit's Jessica Horii (2) and Cassidy Bargell (24) defend against an Eagle Valley player during a home varsity basketball game in mid-January. Summit's Jesus Moya (10) takes a shot during the Tigers' home win against Eagle Valley in mid-January. 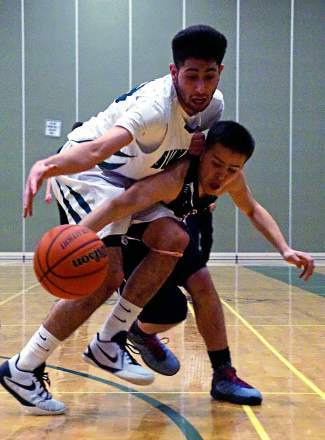 Summit forward Dimitri Preciado defends an Eagle Valley player during the Tigers' home win in mid-January. Summit wrestler Dean Vangnes takes his opponent down during his match in the 152-pound weight category at a home meet on Jan. 13. 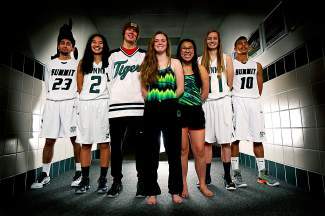 Editor’s note: This is the second part of a two-part interiew series with Summit HS athletes. Click here for the first part. 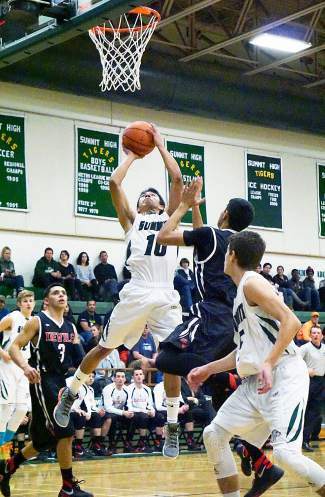 The hoops season is well underway in Summit County. 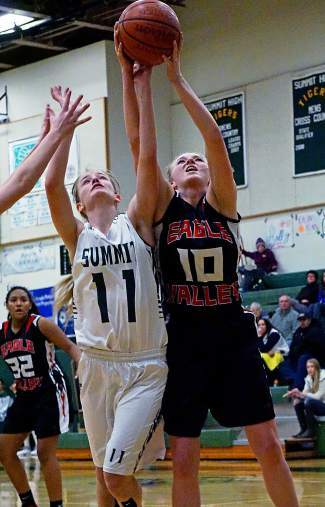 By now, both Summit HS basketball teams have finished their early-season tournaments and are in the thick of inter-league play. The 4A Western Slope is tough with regular powerhouses like Palisade and Rifle, but the Tigers managed to stick close with rivals Battle Mountain and Eagle Valley. The boy’s team beat Eagle Valley at home in mid-January and is looking for a repeat when they meet again in Gypsum on Feb. 2. Until then, captains for both varsity squads have their work cut out for them at practice and on the hardwood. The Summit Daily sports desk caught up with the Tigers captains for their thoughts on the season, their favorite pre-game rituals and what comes after high school ball. Megan McDonnell is a machine on the hardwood. This season, the senior captain leads the girl’s team in rebounds, assists and steals, and she’s regularly one of the highest-scoring starters along with junior Kate Tomlinson. At 18 years old, McDonnell has been playing basketball since discovering it during a third-grade knockout match. She lives and breathes for the win and is doing all she can to help the team in that department: The Tigers are 0-5 in the league after several tight, near miss games, and the captain is ready for a win — hopefully against Battle Mountain at home on Feb. 4. My first memory on the court: Third grade playing knockout. I fell in love with the sport right away after winning a couple games. My team and getting better each season kept me coming back each year. My basketball highlight: Winning against Battle Mountain in double overtime my sophomore year. It was the only league win of the season so the gym was extremely loud at the end of the game. My favorite memory off the court: All the bus rides, from singing to gossiping to solving riddles. I have hundreds of memories from various bus rides. After traveling to districts last season we spent the three-hour bus ride singing. Bus rides are good team bonding. If I weren’t playing basketball in January…: I think I would be Nordic skiing because I participated in Nordic in elementary and middle school. Pregame meal: I would say my favorite pregame meal is pasta. Post-win celebration: Celebrating with my teammates and talking about moments in the game, such as fouls or shots. Favorite pump-up music: I don’t have a particular song or artist I like to listen to before games, as long as there is some sort of music playing. My pregame ritual: I don’t have any pregame rituals but I always wear black socks during games. My biggest rival: The team’s biggest rival is Battle Mountain because each year of my high school career we have won a game and lost a game against them. The games always come down to the wire and are very unpredictable. Do I still get to ski and snowboard? I do not ski or snowboard so I do not miss any time on the snow. Jess Horii is McDonnell’s co-captain and the yin to her yang. While the forward leads the team in stats, her 17-year-old counterpart is a brick wall in the paint and currently leads the team in offensive rebounds. She’s been playing just as long as her co-captain — Horii took a single year off in sixth grade — and has improved immensely over time. Defense is her calling and she’s a key motivator for the entire team. My first memory on the court: The first time I played basketball was in third grade for our elementary school optimist club-sponsored team. I don’t know if it was love right away, but I just really liked spending time after school messing around with my friends. I was not very good but I really enjoyed stealing the ball. Why I fell in love with basketball: I kept coming back because many of my friends played and the older I got, the more I understood the game. I began to get better and I improved a lot every year. As I got better I contributed more and more and it became more fun and rewarding. Each year I would be more excited to come back because I wanted to test my abilities and continue improving. My basketball highlight: When we beat Battle Mountain away last year. They had beaten us already once that season and they were very confident going into their senior night game. We all played really well together and as the game progressed we established a lead. They got frustrated and we kept getting better. This win helped us qualify for the district tournament and gave us the redemption that we wanted. My favorite memory off the court: Riding the bus home from our district tournament in Grand Junction last year. We had just suffered a pretty significant loss, but as we left the hotel to get back to school I felt like we really bonded as a team. The whole bus ride home everyone was singing and recounting funny memories from the season. We were all upset about the game and having to go back to school, but it made me realize how much my teammates mean to me and how I was already excited for next season. If I weren’t playing basketball in January…: I would probably be trying a variety of different activities. I would probably ski a lot more and maybe try my hand at swimming or Nordic, but I don’t think I would enjoy them as much. I would try to train more for track and even attend some indoor meets. Pregame meal: Definitely spaghetti. Whenever we have a team dinner it is pretty clear the way to any athlete’s heart is pasta. Post-win celebration: Usually after a big win I ride the bus home with my team and everyone recounts their highlights from the game. Then I get home and treat myself to a good dinner and a bowl of ice cream. Favorite pump-up music: The songs I listen to tend to change depending on my mood, but I feel most pumped up when they are being played loudly. Our team usually listens to music during our warm-ups before games and if we are in the weight room. We either have a playlist made by our coach or just the pop and hip-hop workout station on Pandora playing. My pregame ritual: Before every game I eat an apple. I always seem to get hungry when I’m nervous, so eating an apple makes me feel better. It fulfills my hunger while making me feel like I am going to do better because I have the nutrients and natural sugars in my body. I also like to do some sprints, usually up and down an empty hallway because it helps get my legs moving. I feel warmed up and those 10-second sprints help focus my mind on the game. If I ever forget to run I feel sluggish in the game and have trouble in the first quarter. My biggest rival: Battle Mountain, because in the past the games have all been really close and we may win one and they could win the next. I also think this will be a fun season because we can consider any team in our league our rivals. We have developed our team to a point where almost any game is winnable and if we play hard we can beat some teams that have always beat us in the past. Do I still get to ski and snowboard? With games so often and having to work most Sundays it is very difficult to find time to ski. I definitely miss getting out on the snow some days, but I try to make up for the time I miss by getting out during long weekends or any breaks. The boy’s basketball team has had an up-and-down season this year, with one hard-fought win against rivals Eagle Valley at home and several close loses to other league teams. Through it all, junior Jesus Moya has been a go-to playmaker. He leads the team in points and is the sort of quick, smart, light-footed player who can follow a wayward shot for a point on the rebound. Along with sophomore Dimitri Preciado, Moya will help “galvanize” the team for head coach Paul Koslovsky over the next two seasons. But first comes the second half of league play, and Moya is leading the charge. My first memory on the court: The first time I played basketball was just because of gym class. I just took it as a game that I played for a class and saw nothing more behind it until future years. My basketball highlight: Last year when we traveled to Mesa State University to play in the district playoffs because I got the chance to play on a college basketball court with something I had never experienced, like light-up backboards and being put on the local school TV channels. My favorite memory off the court: When we go to team dinners before a home game because it gives us bonding time. One memory from one of these dinners was when two of our players started playing the piano and freestyle rapping to it, which was pretty cool and unique see and hear. If I weren’t playing basketball in January…: I would have maybe tried out hockey just because it seems interesting. Pregame meal: I honestly could eat anything before a game and it wouldn’t really affect me, but if I had to choose one food it would probably be to have some pasta or noodles of some sort. Post-win celebration: Going out with the team somewhere to eat and just talk about how we played and the cool moves or things we did. My pregame ritual: I have no real pre-game rituals but I also like chewing gum during games to clam me down. 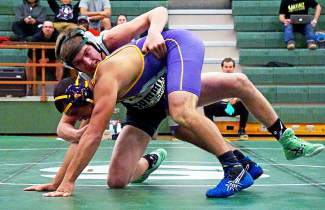 My biggest rival: As a team/ school I would say that our rival is Battle Mountain because of history, with their coach leaving and coming here then leaving back over there. Do I still get to ski and snowboard? I snowboard in the winter, however I don’t snowboard much overall so doing a winter sport doesn’t really mess with that. Dimitri Preciado is one of the youngest starters on the Tigers basketball team and he earned every minute of play. The 15-year-old sophomore from California is an animal on the arc and leads the team in three-pointers. He’s also a strong presence on defense, with a keen eye for strong opposing players — and how to stifle them. My first memory on the court: In the fourth grade. I was on the team with one of my best friends and we won most of our games. Why I fell in love with basketball: I think I fell in love with the game when I first started to play. What kept me going back to basketball was the thrill to compete versus others at a young age and just playing with friends. My basketball highlight: Freshman year going 12-2. My favorite memory off the court: Everything I do outside of basketball is based on basketball. I mostly do everything for myself, family and basketball. If I weren’t playing basketball in January…: I seriously can’t imagine myself playing any other sport other than basketball. My passion for basketball is super high. Pregame meal: I usually eat something healthy or something that doesn’t make my stomach feel bad during a game. Post-win celebration: I usually just hang out and relax and think about what I could improve on. Favorite pump-up music: I don’t have any specific song, artist or type of music that I listen too before a workout or game. My pregame ritual: I usually just tell myself that if I’m gonna lose, I’m gonna lose when I give my team my all and everything I got. My biggest rival: Battle Mountain because in eighth grade I lost to them in the championship game by two, 39-37. Also, the old coach for Summit went back to Battle Mountain, which makes the rivalry between us bigger. Do I still get to ski and snowboard? I know I live in summit but I hate the snow. I don’t snowboard or ski. I was born in California so the weather is different.